In the past, if you wanted to get a computer to do something, you needed to program it. But with machine learning and deep learning — two foundational technologies of artificial intelligence (AI) — we can now train machines to use data to sense, learn, reason, make predictions and evolve. And the technology breakthroughs we’re seeing each day mean we’re going to see more and more of these applications in the very near future. Dell EMC is at the forefront of AI, providing the technology that makes tomorrow possible, today. Dell EMC uniquely provides a portfolio of technologies — spanning workstations, servers, networking, storage, software and services —to create the accelerated high performance computing (HPC) solutions powered by Intel® Xeon Phi™ coprocessors that underpin successful machine learning or deep learning implementations. 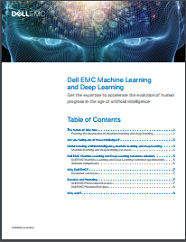 What’s more, Dell EMC has the expertise, accelerated performance and building block solutions to help you adapt as machine learning and deep learning evolve over time. Download this overview from Dell EMC and Intel® to learn more. Intel, the Intel logo, the Intel Inside logo, Xeon, and Intel Xeon Phi are trademarks of Intel Corporation or its subsidiaries in the U.S. and/or other countries. Please send me offers and announcements from Dell EMC, its group of companies, subsidiaries and authorized partners. Yes, please send me offers. For more information about how Dell EMC uses and protects your data, click here.